1. Preheat the grill to medium. Line a baking tray with foil and melt half the butter. Brush a little over the foil, place the mackerel on top and brush with the remaining melted butter. Grill for 12 minutes until thoroughly cooked. 2. Cook the potatoes in a pan of boiling water for 8-10 minutes, until tender. Add the samphire and cook for 1 more minute. Drain. 3. Melt the remaining butter in the saucepan and cook the salad onions for 1 minute. Tip in the potatoes and samphire and mix well. 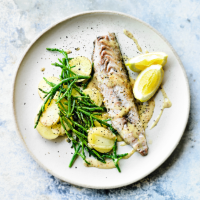 Transfer to plates, top with the mackerel fillets and serve drizzled with dressing.